Toyoda Machine Works,Ltd., a predecessor of JTEKT Corporation, was the first company in Japan to develop a semiconductor transducer (Bulk type) that made the piezo resistance effect a principle with the Toyota Central Research & Development Laboratories. After that we pursued precision and stability, and we have been able to quickly develop and deliver diffusion type pressure transducers. Since then we have supplied a large number of products. We have accumulated considerable knowledge and technological capabilities since 1966, and it is this combined experience that will enable us to continue producing cutting-edge semiconductor transducers well into the future. Our PYS-3 line features a small pressure-area of 3mm and a weight of only 2g. Our bulk type pressure transducers offer extremely high natural frequencies of above 10k-100kHz/min., making them extremely well suited for the task of measuring pressure waves containing high-frequency components. Our diffusion type pressure transducers feature a non-linearity of ±0.2% F.S. and ± 0.02% F.S. with repeatability, ensuring highly precise measurement. 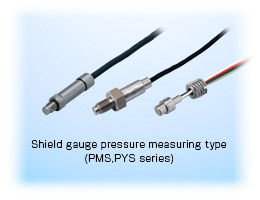 These metallic diaphragm-type pressure transducers offer high natural frequencies of 10k to 100kHz, making them extremely well suited for the task of measuring pressure waves containing high-frequency components. Moreover, PYS line is extremely small but it's rated pressure range is 500k to 50MPa and can correspond to diverse measurements. 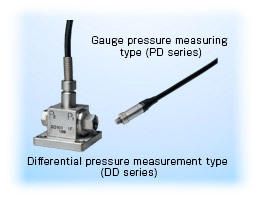 The PD line is a gauge pressure transducer using a silicon diaphragm. It features high accuracy, along with good temperature characteristic and stability. It suits a wide range of applications for laboratories, built into controllers and other equipment. It features high accuracy and stability. It is well-suited for a broad variety of applications including the measurement of flow volume and rate, and pressure loss compensation. 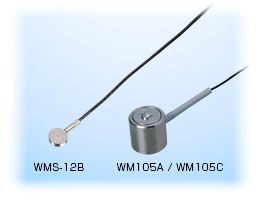 These are compact, high-sensitivity load cells usuing semiconductor strain gauges. They also perceive a dynamic load accurately, so they can be applied to research and experiments. 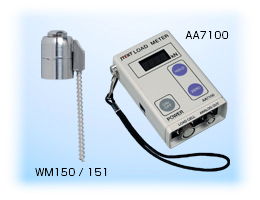 WM105A and WM105C are load cells that can measure high-loads. 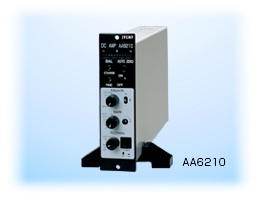 The AA6210 is an amplifier featuring excellent linearity and stability. and is designed to take advantage of the high performance of our transducers. 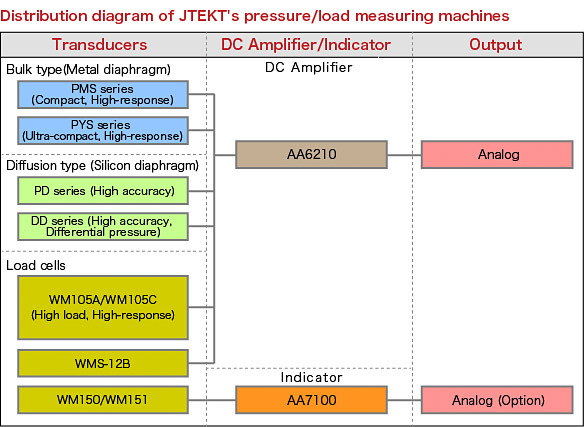 1 The AA6210 is directly connectable to all of JTEKT's semiconductor transducers (pressure transducers and load cells). makers and for general-purpose voltage signal measurement. 2 A built-in calibration voltage circuit allows the checking of input signal levels. 3 Features a wide frequency band of DC ~100kHz(-3dB). A sensor is attached in place of the electrode tip, and the pressure applied by spot welding guns is measured as welding is performed. It enables setting pressure of a spot weld machine easily by combining with an exclusive indicator.